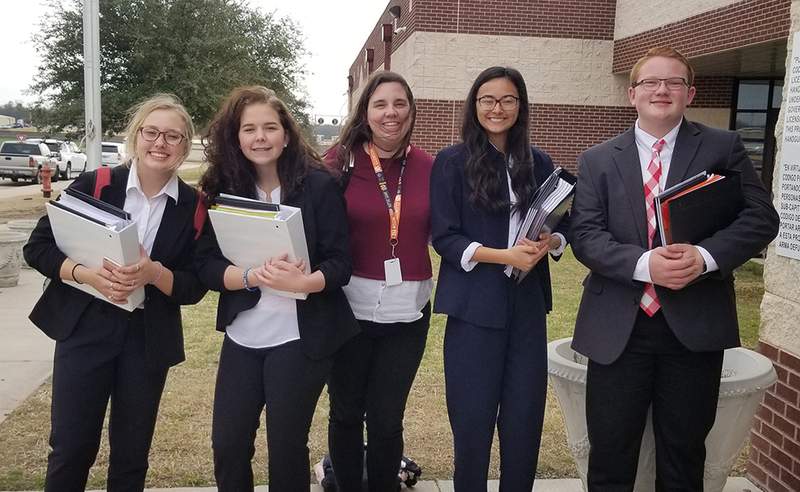 The Coahoma High School team of Grayson Glidewell/Aubrey Green and Julia Cox/Brianna Coskey placed 5th and 7th respectively in their first CX (Cross Examination) contest at the 5 3-A UIL District meet held in Clyde Wednesday. Glidewell and Green went 2-1 at the meet and earned 167 speaker points. Cox and Coskey went 0-3 and earned 160 speaker points. Cox was rated top speaker in her first debate round. Points earned by Glidewell and Green from their fifth place finish will carry over for the CHS academic team in the upcoming UIL meet. “Considering that was our first time competing in this event and we got some numbers, that felt good for us,” Cox said. The CX members are used to competing at a high level in speaking events. Cox and Green have qualified for state competition in FFA (Future Farmers of America) LDE events twice and Cox place 16th in the nation at the FFA national convention in the Creed event held in October. However, this type of format was new to all four students. In fact, both Glidewell and Green said competing against the eventual winner of the meet, Jim Ned 1, for their first debate was a very good learning experience. “We would be CXing them and asking them questions and they’d make a point and I was like, ‘you know that makes a lot of sense,’” Glidewell said. Yet, both sophomores said they put that knowledge into use in their next two debates. “I took so many things that they said against us and used it later on, so it made me sound really good,” Green said laughing. “They were prepared and they knew what they were talking about, and I think that helped us in the second and third round,” Glidewell added. After each debate, the four students met and exchanged notes to help them to develop stronger arguments and become more persuasive speakers in the next round. Glidewell said he enjoyed the persuasive part of the competition. As for the best part of the meet, Cox, who plans to become a lawyer, said she really enjoyed arguing her points aggressively. “I was like I am not going to be mean and she (Cox) was like ‘I am going at them,’” Coskey said drawing laughs from the other three students. CX is a UIL sanctioned event where students are given a set topic to research at the beginning of the competition season. Competitors must prepare to defend both an affirmative and negative position depending what they are assigned at the debate. This year’s topic found on the UIL website is: Resolved, the United States federal government should substantially reduce its restrictions on legal immigration to the United States. Because all research must be done before the debate, students can bring in binders full of information to reference or a computer, but the computer can not be connected to the internet. “If they (the opposing side) ask for your case, you have to give them any evidence you have,” Glidewell explained. Overall, all four students said they enjoyed the meet and are eager to begin preparing for next year’s competition.